OrbSys Saves Water By Letting You Shower in the Same Water, Again and Again | OhGizmo! Water is a finite resource. At the rate things are going, it’s going to run out sooner rather than later. Then what would become of the human race? 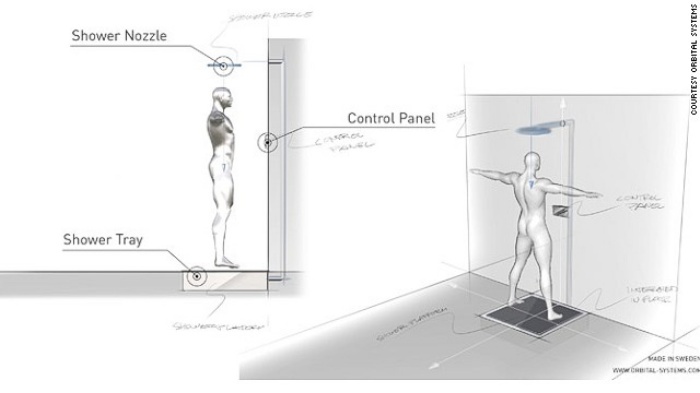 Working with this line of thinking are the folks behind the OrbSys shower system, which encourages people to conserve and recycle water as they bathe. Of course, the water is purified before it’s meant to be used again because it would just be gross if it weren’t. OrbSys offers ten-minute showers that only use five liters of water. Normally people use about 150 liters for a typical shower, so that’s reducing water usage by about 96%. This is made possible by the shower’s closed-loop system that purifies the spent water to drinking water level before it comes out of the shower head for it’s succeeding runs. Orbital didn’t provide additional information on how their filtering system can purify the water so quickly to such levels, though. You can request for info about OrbSys here. Even if it can purify water – it doesnt come for free, it would require electricity, chemicals, filters – and those arent free and have environmental imprint too (co2 AND water). So basically the question is – is *net* value positive? i bet not. its more of excuse device for owners of multiple sports-cars.